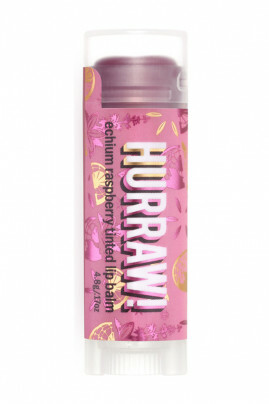 Hurraw Natural Lipbalm with Raspberry provides a deep pink sheer tint! Its formula rich in organic oils and butters made from premium raw, protects and nourishes. Your lips are smooth and moisturized with its natural delicate fragrance. All the Hurraw Lip Stick Balms are 100% natural, vegan (no animal-derived ingredient) and cruelty-free (not tested on animals). Handcrafted production, the quality of cold pressed oils and raw buttersissuperb : you will see the difference ! Discover their complete range of 25 different flavours! Rajouté en contactant Ariane avant expédition de ma commande, je ne regrette vraiment pas cet achat.Il donne bonne mine en rosissant légèrement les lèvres mais surtout, il les nourrit comme aucun autre baume. Il ne colle pas, et dure longtemps, pas besoin d’en remettre sans cesse comme c’est le cas avec des baumes moins naturels du commerce. Un sans faute pour ce produit ! HURRAW Natural Raspberry Lip Balm moisturizes your lips all day! Apply HURRAW Vegan Lip Balm at any time when you need it! It can also work as a primer for your lips before applying lipstick. 100% natural ingredients and 0% artificial colourant in this tinted lip balm! 100% plant-based color = no iron oxides (metal), carmine (cochineal insect) or d&c lake dyes (petroleum). The tint of the Echium Raspberry Balm can vary in color.